Birds and mammals in their habitat, with preliminary field sketches usually drawn directly onto the canvas or board and overpainted in acrylics and oils. My paintings are about movement, light and colour, and attempt to convey a sense of time and place. A group of Shorelarks at Holkham Bay in North Norfolk. A Water Rail at the edge of a reedbed. of Russ Heselden and is protected by international copyright laws. 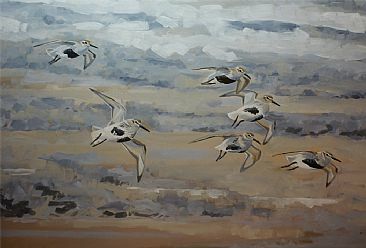 Use of nature art, wildlife art or any other images or text from this site, requires permission in writing from Russ Heselden (Russ Heselden Wildlife Art). This site is part of the Artists for Conservation (AFC) Web site. (Wildlife Art - Nature Art - Conservation) Artists for Conservation is an international, non-profit organization dedicated to nature art, wildlife art and conservation. On this site you will find world-class nature art and wildlife art by today's leading nature artists & wildlife artists. The AFC site is the Web's premier location for nature art, wildlife artists All content appearing in pages featuring Russ Heselden is the sole responsibility of Russ Heselden. The opinions expressed on these artists' pages are those of Russ Heselden and do not necessarily reflect those of the Artists for Conservation Foundationi (AFC).